Description: This week marks the third anniversary Hurricane Katrina devastated the Gulf Coast region of the United States, leaving nearly 2,000 dead and many more physically and emotionally scarred. A new report shows that recovery since the disaster has been mediocre at best. While many continue to point blame at different factors for poor recovery, some enterprising activists are getting online and taking care of business on their own. What Are They Doing: Online mapping and blogging have become popular ways to show what areas in New Orleans still need help in the rebuilding process. New Orleans resident Karen Gadbois used her blog to protest pharmacy chain Walgreens wanting to build a store in her NorthWest Carrolton neighborhood to replace a supermarket that neighbors would prefer to have back. Gadbois also used Google Maps to show undamaged homes that were deemed for demolition by the city. 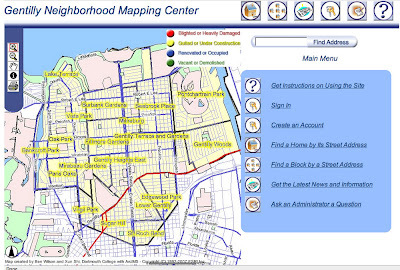 Dartmouth College professor Quintus Jett helped create an open source mapping service, Gentilly Project, to engage New Orleans citizens to take charge in recovery efforts. Gentilly residents can go to the mapping website and enter information about what level of restoration is still needed in that section of New Orleans. Jett says that the map has not only made it easier for contractors to find where rebuilding is needed, mapping has also empowered residents.